Download "Curriculum Vitae. Géraldine Heilporn"
1 Curriculum Vitae Géraldine Heilporn Géraldine HEILPORN Web: gheilpor/ Citizenship: Belgian. 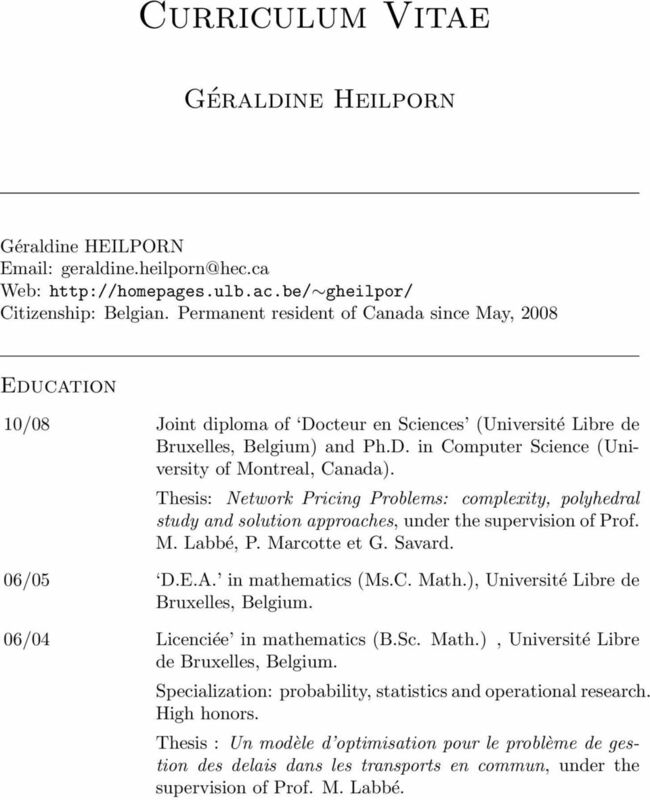 Permanent resident of Canada since May, 2008 Education 10/08 Joint diploma of Docteur en Sciences (Université Libre de Bruxelles, Belgium) and Ph.D. in Computer Science (University of Montreal, Canada). 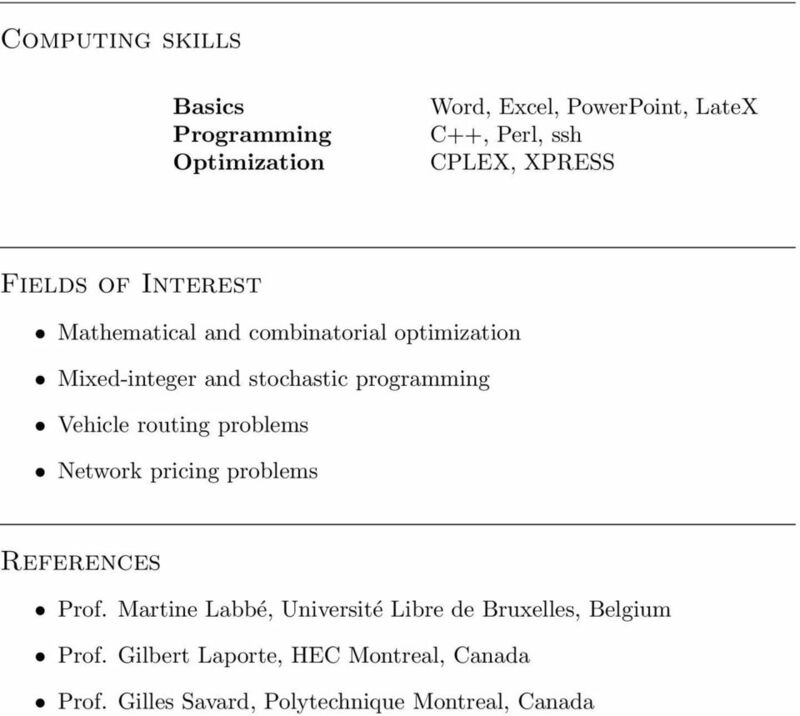 Thesis: Network Pricing Problems: complexity, polyhedral study and solution approaches, under the supervision of Prof. M. Labbé, P. Marcotte et G. Savard. 06/05 D.E.A. in mathematics (Ms.C. Math. ), Université Libre de Bruxelles, Belgium. 06/04 Licenciée in mathematics (B.Sc. Math. ), Université Libre de Bruxelles, Belgium. Specialization: probability, statistics and operational research. High honors. Thesis : Un modèle d optimisation pour le problème de gestion des delais dans les transports en commun, under the supervision of Prof. M. Labbé. 3 G. Heilporn, Network Pricing Problems: complexity, polyhedral study and solution approaches, thèse de doctorat, Université Libre de Bruxelles, University of Montreal. Published by VDM Publishing House Ltd, ISBN G. Heilporn, M. Labbé, P. Marcotte and G. Savard, New formulations and valid inequalities for the Toll Setting Problem, INCOM 06, A Proceedings volume from the 12th IFAC International Symposium, Elsevier Ltd, 06. 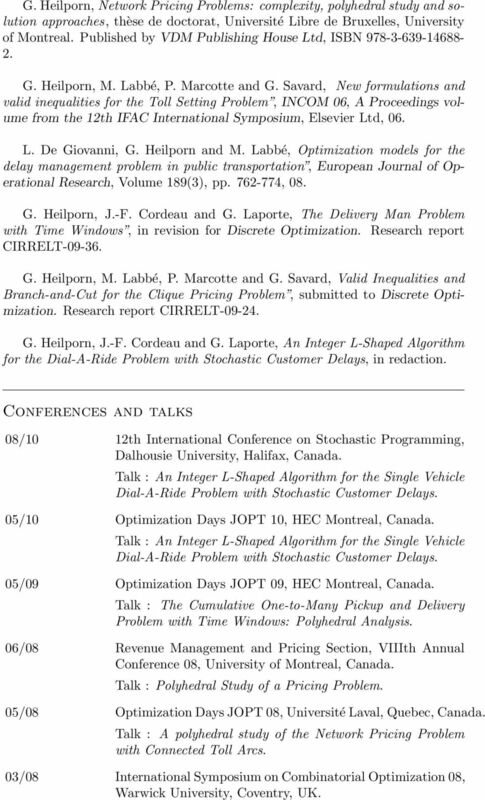 L. De Giovanni, G. Heilporn and M. Labbé, Optimization models for the delay management problem in public transportation, European Journal of Operational Research, Volume 189(3), pp , 08. G. Heilporn, J.-F. Cordeau and G. Laporte, The Delivery Man Problem with Time Windows, in revision for Discrete Optimization. Research report CIRRELT G. Heilporn, M. Labbé, P. Marcotte and G. Savard, Valid Inequalities and Branch-and-Cut for the Clique Pricing Problem, submitted to Discrete Optimization. Research report CIRRELT G. Heilporn, J.-F. Cordeau and G. Laporte, An Integer L-Shaped Algorithm for the Dial-A-Ride Problem with Stochastic Customer Delays, in redaction. Conferences and talks 08/10 12th International Conference on Stochastic Programming, Dalhousie University, Halifax, Canada. Talk : An Integer L-Shaped Algorithm for the Single Vehicle Dial-A-Ride Problem with Stochastic Customer Delays. 05/10 Optimization Days JOPT 10, HEC Montreal, Canada. Talk : An Integer L-Shaped Algorithm for the Single Vehicle Dial-A-Ride Problem with Stochastic Customer Delays. 05/09 Optimization Days JOPT 09, HEC Montreal, Canada. Talk : The Cumulative One-to-Many Pickup and Delivery Problem with Time Windows: Polyhedral Analysis. 06/08 Revenue Management and Pricing Section, VIIIth Annual Conference 08, University of Montreal, Canada. Talk : Polyhedral Study of a Pricing Problem. 05/08 Optimization Days JOPT 08, Université Laval, Quebec, Canada. Talk : A polyhedral study of the Network Pricing Problem with Connected Toll Arcs. 03/08 International Symposium on Combinatorial Optimization 08, Warwick University, Coventry, UK. 4 Talk : A polyhedral study of the Network Pricing Problem with Connected Toll Arcs. 08/07 International Conference on Continuous Optimization 07, McMaster University, Hamilton, Canada. Talk : Theoretical properties of a Network Pricing Problem. 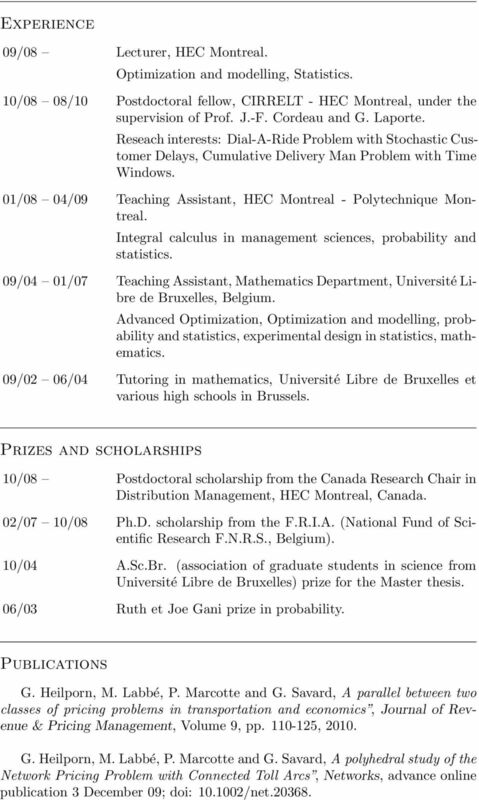 07/07 Mixed-integer Programming Seminar MIP 07, University of Montreal, Canada. 05/07 Optimization Days JOPT 07, University of Montreal, Canada. Talk : On a Network Pricing Problem with Connected Toll Arcs. 06/06 07/06 Advanced Mathematical Seminar SMS06, University of Montreal, Canada. 05/06 12th IFAC Symposium on Information Control Problems in Manufacturing INCOM 06, Ecole Nationale Supérieure des Mines, Saint-Etienne, France. Talk : Models and valid inequalities for the Toll Setting Problem. 02/06 ROADEF conference, Lille, France. Talk :Modèles et inegalites valides pour le problème de tarification routière. 09/05 ORP3 conference, Universidad Politecnica de Valencia, Valence, Spain. 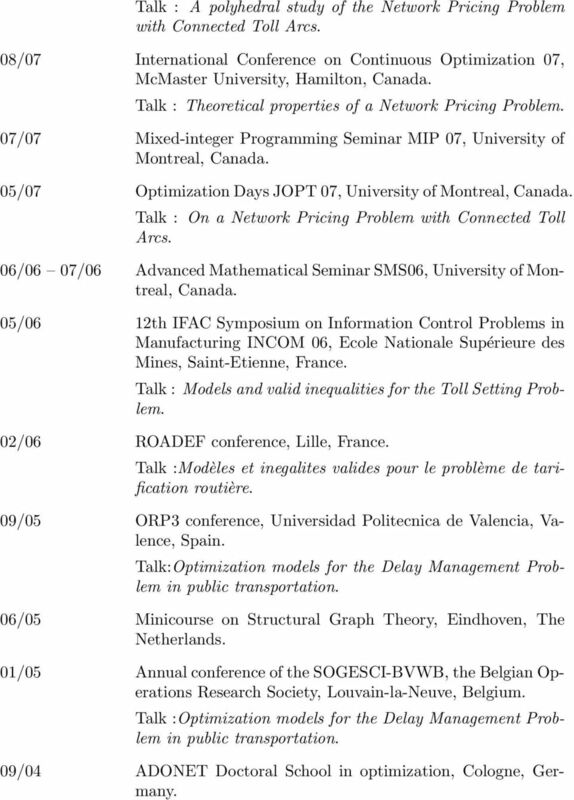 Talk:Optimization models for the Delay Management Problem in public transportation. 06/05 Minicourse on Structural Graph Theory, Eindhoven, The Netherlands. 01/05 Annual conference of the SOGESCI-BVWB, the Belgian Operations Research Society, Louvain-la-Neuve, Belgium. Talk :Optimization models for the Delay Management Problem in public transportation. 09/04 ADONET Doctoral School in optimization, Cologne, Germany. Curriculum vitae Marcelin Joanis, Ph.D.
CURRICULUM VITAE. 2006-2013 President of the Board of Directors of the Annales des Sciences Mathématiques du Québec. CURRICULUM VITAE I. PERSONAL INFORMATION II. EDUCATION. NAME : Miguel Andrés Maldonado Saavedra. Lorenzo Cerda Planas 30 rue Hippolyte Maindron Paris (75014) lorenzo.cerda@gmail.com +33 (0) 6 3339 4424 EDUCATION 2011 2015 PARIS 1 PANTHÉON-SORBONNE (Paris School of Economics) Paris, France PhD in Economics. CURRICULUM VITÆ. Education. Latest update : August 2015. Sanjay Ramassamy Graduate student at Brown University. EDUCATION 2014 Ph.D. in Management Sciences CERGAM Centre d Etudes et de recherche en Gestion d Aix-Marseille (UFR IMPGT), Aix Marseille Universite. Ghizlane El Boussaidi http://pages.videotron.com/ghizlane/ 3207, boul. Lévesque Est Phone : (450) 661-4397 Laval, Québec, Canada email : gelboussaidi@gmail.com H7E 2P4 Citizenship: Canadian EDUCATION Ph.D.
Master s Degree in Engineering & Management "ICM "
B. Delyon. Stochastic approximation with decreasing gain: convergence and asymptotic theory. Unpublished lecture notes, Université de Rennes, 2000. Some References Laetitia Andrieu, Guy Cohen and Felisa J. Vázquez-Abad. Gradient-based simulation optimization under probability constraints. European Journal of Operational Research, 212, 345-351, 2011.
stefanwintein-at-gmail-dot-com Adress: Personalia 6-6-1979, Middelburg, Netherlands.